In most cases, lack of time to go to the gym amidst the tight work schedule has been blamed for people being unfit which can put their health in serious risk. However, to put this matter to rest and avoid confrontation and conflict, there are a variety of exercises that have been devised that you can work on regardless of where you are. Even at your workplace. The best part is that these exercise are inclusive of everything even how to jump higher. As you would have it, the best way to start any exercise routine is preparing your muscles for the work out and stretching is always the best way to get started. The best part is that you can stretch from head to toe without leaving your desk. For your head, you can start by tilting your neck right and then left towards your shoulders holding each tilt for about 10 seconds. This is great for your neck muscles and helps them to start generating the heat. Down to your shoulders after you have completed stretching your neck, roll them both in a forward motion to release stress then backward. On each roll, repeat the motion 10 times. Move to your wrists and give them a stretch as well by stretching out your arm with the palm facing down then pulling on the finger with the free arm and holding for 3 seconds. After you can alternate and now stretch the opposite hand. Finally, you have the legs. Stretch on of your legs out on the floor and with your toes pointing upwards flex your ankle. Then do the same in the opposite direction and finally you can draw some circle using your toes as the tether. Repeat each step 10 times before you can make the switch. Now that you’re all warmed up, you can begin with the exercise without any worries. While sitting down or leaning against a bifold door, you can lift your leg up and down to work your thigh muscles. Lift each leg ten times before you switch. Also while at the photocopying machine, you can use the standing time to work your back thigh muscles by again lifting you your leg but this time backwards and as high as you can. To get the most out of it, make sure you also resist the movement on the down stroke. These are called the glute kicks. For your calves, you can do calf raises by standing on one foot and then raise yourself up slowly with the toe pad retaining contact with the ground. These are called calf raises. For the upper body, you can make full use of your chair but be careful not to break it less it comes out of your pay check. Start by holding on to the arm rests of the chair then lift your feet off the ground. Using your arms as the only form of support that you have, raise your entire body mass this helps to work out your arms, biceps, triceps and the chest muscle. It’s an all in one upper body work out. As it stands right now, there is virtually no reason that you can give for having to spend more than 8 hours at your desk without any time to work out. 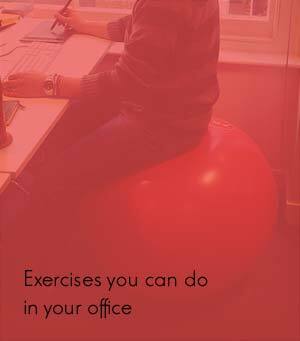 Some of these exercises can even be incorporated as you work.